The Epicurean Group regroups and expands. As an accountant and an attorney, Stanley B. Dickson Jr. has seen his share of turnarounds — but he never envisioned taking on a struggling restaurant group and whipping it back into shape. After his former client, restaurateur Matt Prentice, ran into financial difficulty in 2009, Dickson bought Prentice’s collection of eateries and kept Prentice on as operator. At the time, Prentice signed a five-year, non-compete clause, but resigned last March, citing a disagreement over the opening of future restaurants. In July, when it became clear Prentice was set to open Morels and a neighboring restaurant, to be called Detroit Prime, in Farmington Hills (his original Morels in Bingham Farms closed in 2006), Dickson filed a lawsuit seeking to enforce the non-compete agreement. Dickson declined to talk about the lawsuit, and says he holds no ill feelings against Prentice. Rather, the son of a fourth-generation baker is looking ahead. Since closing two of the nine restaurants and tweaking the management staff of the former Matt Prentice Restaurant Group, now called The Epicurean Group, Dickson has been moving at near-light-speed. 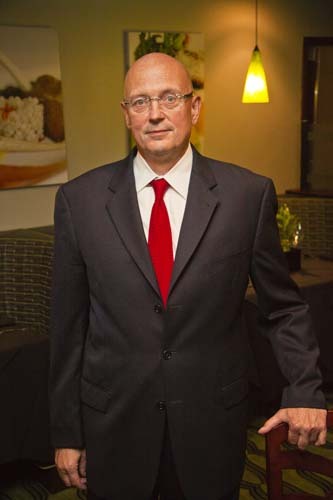 He named Eric Djordjevic, former food and beverage director at the Detroit Athletic Club, president of the new entity. He also made sizeable investments in the business, including spending $100,000 for new vehicles and equipment for the catering division, and he’s in the planning stages of constructing a 30,000- square-foot greenhouse. Dickson also opened Gastronomy in Southfield, a modern American bistro where all of the food is made from scratch, using locally-produced ingredients. “We’ll be doing a lot of craft cooking, such as making our own bacon,” he says. Epicurean’s seven other restaurants — Northern Lakes Seafood Co., Coach Insignia, Novi Chophouse, Plaza Deli, and three Deli Unique locations — are now profitable. Dickson also is expanding several related businesses, including Sour Dough, a bread factory in Pontiac that supplies The Epicurean Group and a private client, Hiller’s Markets. Dickson manages nearly $300 million with Pacesetter Management Inc., a commodities investment firm he also owns. All of the businesses, including RBD Creative and Trowbridge Realty, operate from the historic Charles Trowbridge House on East Jefferson in Detroit. Built in 1826, the home is believed to be the oldest residential structure in the city.